Tie dye techniques are never ending. There are always new ways to invent to apply the paint and get a new look. Not only that, but there are ancient applications to break down and conquer. Here are two pieces we came across that our design team is inspired by. The top one is from Thailand and the bottom - well, we are trying to figure out if these gorgeous flowers are photoshopped, if they are dyed silk, or if they were actually grown that way by Willy Wonka! Regardless, it just goes to show that the tie dye is not all about starbursts, hippies or high fashion. It is an art form that can be embraced in many ways by artists as well as designers! Are you thinking about giving tie dye a try? You should! Visit your local craft retailer and pick up our Tulip® One-Step Tie-Dye Kit™ - it's perfect because it comes with a variety of colors to play with! Wow, how beautiful! The tank top looks like a fan fold in the corner with metal tabs to keep the lines so clean, a regular star-burst method with rubber bands, and some free form, all done the old way with eye droppers of dye. 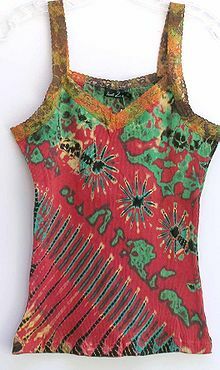 I think the trim is really a dyed trim, tank top may be raw silk from the way the colors are. you can get those flowers at pike place market, ive seen them before. 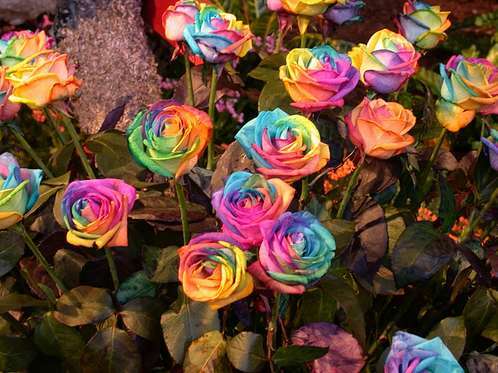 the flowers can be made from paper or coffee filters (or purchased silk flowers) then you just use brushes and watered down acrylic for the silk or watercolor for paper or coffee filter to apply the color (watercolor generally requires multiple coats to get a bright effect)....but..you can also purchase factory made flowers like those. do the tulip glitter sprays stick onto the tie dye pretty well! great pictures! Where are you located?